Discussion in 'Beginners' started by PaulSB, 2 Jan 2008. Guy I know, who currently uses an MTB for everything is planning to do the Three Peaks later this year. He plans to cycle between the peaks and wants to get a new bike for the task! 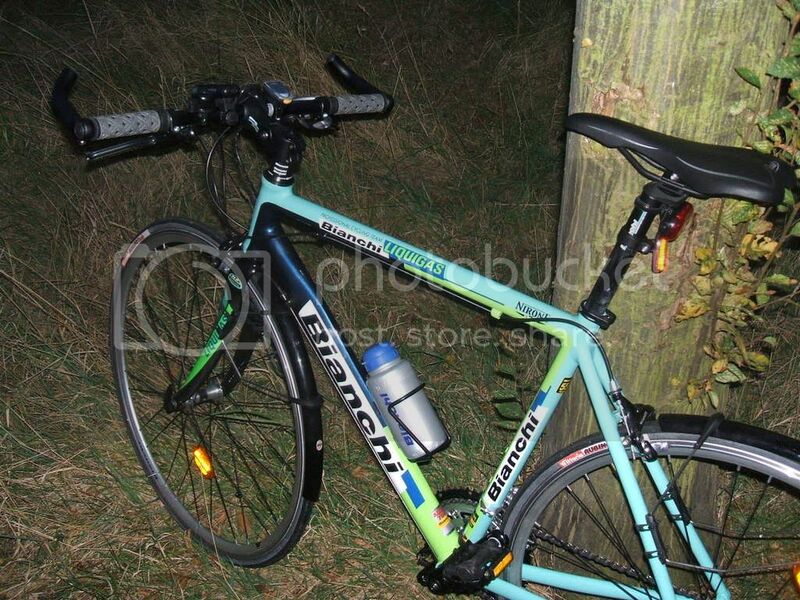 After some research he has decided on a hybrid, in particular the Bianchi Camaleonte III Tiagra 2007 Hybrid. I'm inclined to agree on the choice of a hybrid but while I obviously know Bianchi I've only ever associated them with road bikes. Does anyone have comments on Bianchi hybrids? I've always been a Marin fan myself. tell me you didn't ................ just.............. say.................. Marin. just a little bike snobery. my own of course. ...I'm flatteredthat anyone should think I know anything about bikes! The reality is that I ride a daws galaxy tourer not a hybrid and the only thing I know about bianchi bikes is that I want a via nirone ...mainly because it just looks so cool! I have a Bianchi Via Nirone hybrid, in the team Liquigas colours. It's basically a road bike with flat bars and an extra chainring, and I'm very please with my first "real" bike. It doesn't really help with the Camaleonte III question, but I wouldn't hesitate in getting another Bianchi. BTFB....I have the red and silver 2005 (i think) Via Nirone. Funnily enough, a guy at work was looking at it today and mentioned it looked nice. I said its 3 years old...and he said 'REALLY ...it doesnt look it !!!! '...which i took to be a compliment. Very happy with it then,,,very happy with it now. Therefor PaulSB...if the Cameleonte is as well made, i wouldnt hesitate to buy one. Yep if you are riding the official Three Peaks you must be on a Cyclo Cross bike the rules for the event are mega strict. As far as I recall certain parts of the Three Peaks are of limits the rest of the year as its private land. Not sure from the OP if their friend is doing the official race or planning on following the route. why, when mtbing was in it's infancy in the uk, marin were one of the best bikes you could get? not to mention being one of the first mtb companies in america. From what I've read on the web there are no official rules, it's just something people do. Like cyclists ride LeJog. I could well be wrong but that's the impression I have. Anyway this guy just wants to do it and thinks cycling between the peaks would add somehting to the challenege. I think he's right about that! Anyway thanks for the comments, I hadn't realised Marins are so bad, and there was me thinking my bikes had been getting admiring glances for the last ten years!